Intense – Informative – Funny. Kimathi recalls the events leading up to his heart attack as well as his journey to health, losing 150 pounds, maintaining control over hypertension, addiction, overcoming pain and depression. His story enlightens and inspires others to the true essence of holistic living. 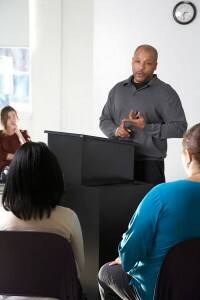 The lectures allow one to focus, cleanse and stimulate growth of the mind, body and spirit. After having multiple addictions and living an unhealthy lifestyle, transforming to health wasn’t difficult. The Cycles of Wellness system was instrumental in his success. Individuals at all levels can acquire information and tips to recognize and remedy the root cause of their life issues, then allowing them to reach their full potential. However, your muscle tone is – if your ancestors were laborers / farmers, and now you live in a push button world, you’re only using the top third layer of your muscle but you have enough blood for all three. This forces your pressure to increase. If your circulation and / or elimination is restricted, your medication is not fully effective, therefore your dosage will increase over time. It doesn’t matter, if your body isn’t absorbing it. Water runs over tight muscles like water over rocks. DO YOU HAVE PARASITES IN YOUR GUT? If you eat meat, you do! One of the leading causes of large bellies are parasites. I’ve found two holistic remedies to kill them and lose weight. Your body runs in cycles. So you need a permanent program of checks and balances, so you can capitalize on your strength and work on your weakness. 85% of people who work out don’t get the full benefit or hurt themselves. Prepare yourself properly so that it can be fun and rewarding.